This is a center step card. 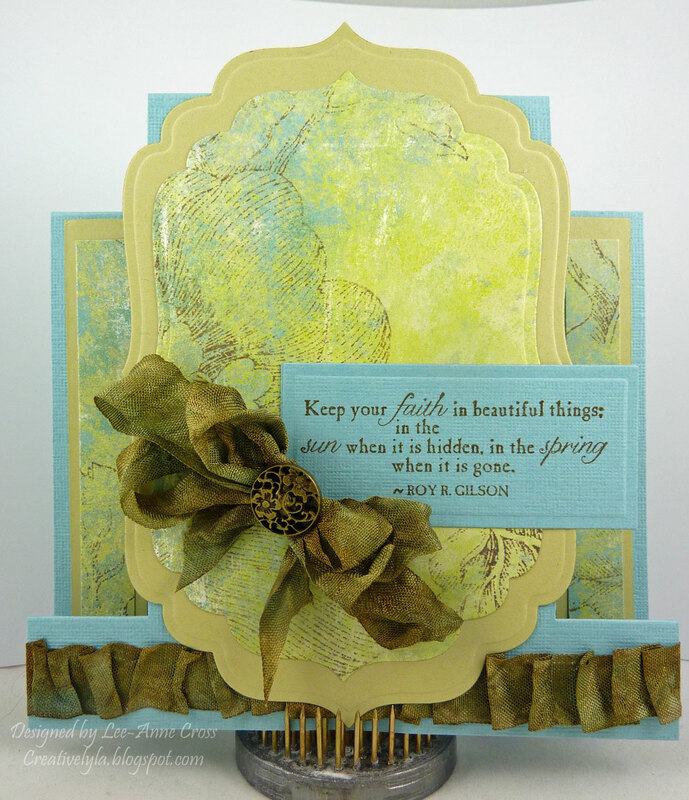 You’ll find a tutorial on Splitcoast stampers for cutting and scoring this card. It’s easy but looks like you’ve done a lot of work! I’ve been hoarding this designer paper forever, so it’s time to cut into it today. I used it for the side strips and also the focal point. The focal point was cut with Spellbinders Nestabilities, once in the designer paper and once in River Rock. The sentiment, which is such a gorgeous quote, has been stamped in River Rock on textured Baja Breeze. I hand-dyed some seam binding and then spritzed it with water, scrunched it and then dried it. The seam binding was pleated along the bottom on some Scor-Tape. I also added a bow with a brad. Hope you enjoyed another two post day!